These cards are CR80 size. These are the same size as credit cards and most standard ID cards. The addition of a 40% polyester core gives these cards more durability and flexibility. This makes the Fargo 82136 cards ideal for colder climates. The cards are at home at ski resorts and mountain resorts. 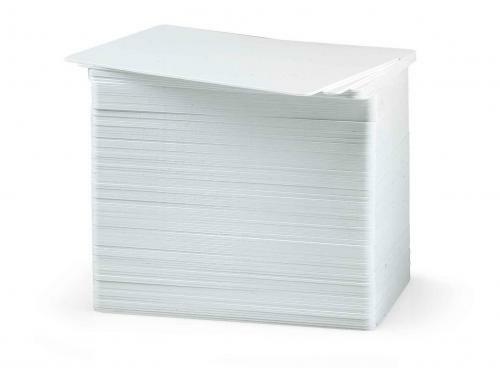 These cards come in packages of 500 in a box, wrapped in 100 card bundles (5 in a box). The careful attention to these cards ensures you will receive stunning print results. The cards are made from PVC material and feature a glossy front and glossy back. They have a very smooth surface and are optically inspected to ensure a clean scratch free card. With such a premium card surface you will get stunning cards and an extended printhead life. These cards are ideal for ID cards, gift cards, membership cards, loyalty cards, visitor cards, and more. CR80 size - 3.37" x 2.13"